Off The Page! has added ‘Dear Johnny… Ever Yours Emma’ to its repertoire as a companion piece to ‘Reflections from the Madhouse’. 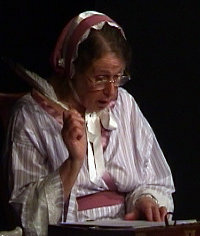 In this 45minute dramatisation, Patti Holloway, as Mrs Eliza (Emma) Emmerson, relives some of the two hundred odd surviving letters sent from her to John Clare between 1820–1838 providing a fascinating insight into social attitudes and divides of the time as well as another perspective on character and nature of Clare himself. More than anything though, we are drawn into the personal story of a woman trapped within a confined clique as she faces her own challenges of illness and isolation. The piece has been researched and compiled by Patti Holloway and is the first time that these letters have been made available to the general public.